Spring time in Alaska generally happens anywhere from March to May depending on the year. The Polar Vortex that has plagued the Lower 48 with abysmally cold weather has had the opposite effect for us. It’s springtime in Alaska but winter isn’t really over. This fake spring is a nice respite from the bitter cold but we know it won’t last. Last week temperatures ranged all over the 40’s and yesterday hit a whopping 52 degrees, ABOVE Zero! It should be 20 below. Or maybe even colder. We should have snow, we did have snow but it’s almost gone now. Going outside should require boots and heavy coats, instead I’m thinking a plain sweatshirt is just too much. Pockets of ice mixed in the grass. 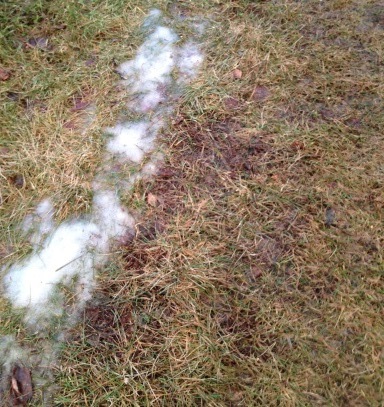 The ground is typically frozen anywhere from 2′ to 10′ deep this time of year. And because of the cold weather in November and December the ground did freeze but this warm weather is thawing it out, from the top down. We have an interesting scenario where the ground is colder than the air, the snow melts and water puddles, but the ground is frozen and refreezes that water into sheets of ice. Super smooth ice that is sometimes clear allowing it to blend in to it’s surroundings with little or no texture to give traction for the unsuspecting pedestrian. 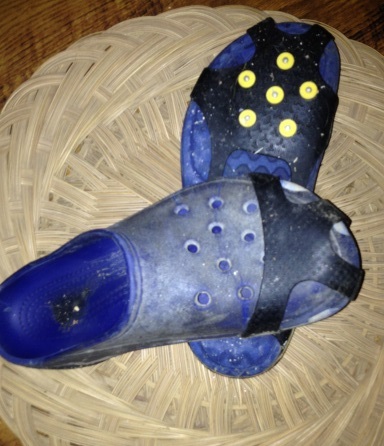 Snow cleats add the traction that plain crocs lack. My idea of a happy medium is to pair my summer barn shoes (crocs) with snow cleats. These strappy little gadgets are a life saver. I no longer need to worry about the clear bits of ice lurking in the grass just waiting for me to step on them. Gone are the fears that I might slip on said ice and fall on my bum, or perhaps do the full body flop, in a chilly puddle of muck and mud. And farm mud is not regular mud, oh no, farm mud has been decorated with a special blend of recycled grains and grasses. A fragrant and beneficial addition to the local flora, not my first choice as a spa treatment. Once we return to our normally scheduled weather I’ll return to my normal winter footwear, until then I’ll be sporting the snow crocs.